Color is a powerful tool. And while we're fans of blue and gray, currently green has captured our attention. This stunning shade — ranging from soft sea-foam to rich emerald — is popping up in stylish homes everywhere. Recently, we've seen a wave of viridescent bathrooms, kitchens, and living areas. 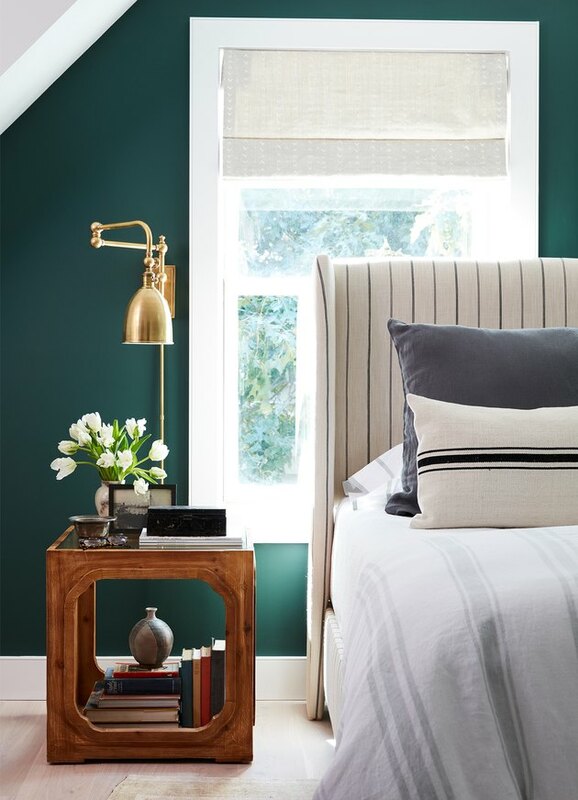 But now lovers of the outdoorsy hue are bringing this lush, leafy shade into the boudoir. 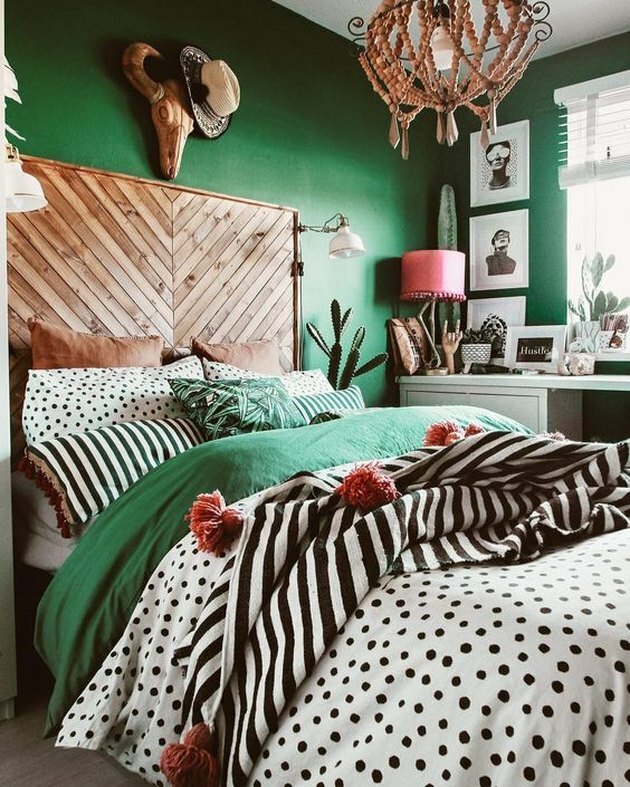 Scroll on for 10 green bedroom ideas that will make you absolutely envious. Dream bedroom alert! 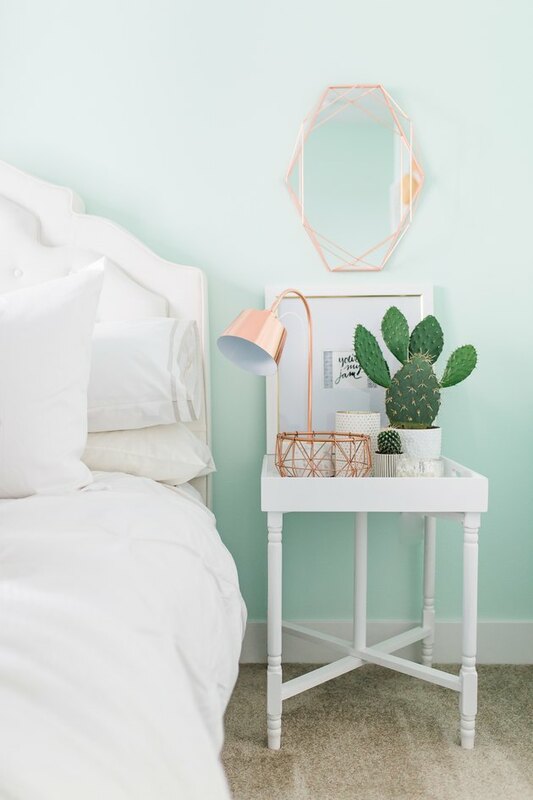 This sanctuary belonging to McKenna from McKenna Bleu is oh-so-chic with pastel mint green walls and crisp white furnishings. Copper accessories and a tiny cactus pull it all together. We dare you to find digs that are more boho-chic than Dabito's guest bedroom. 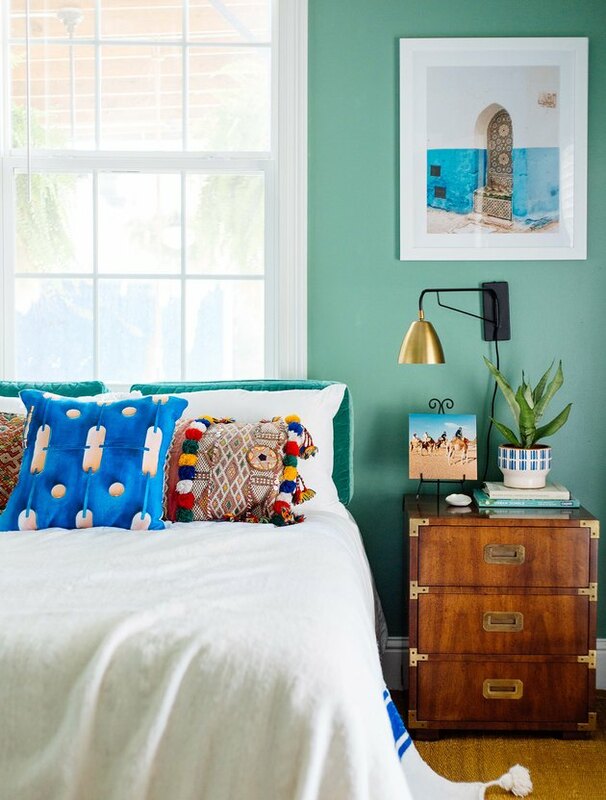 The green paint is super cheerful, and the perfect backdrop for the striking photos taken during his travels around the world. 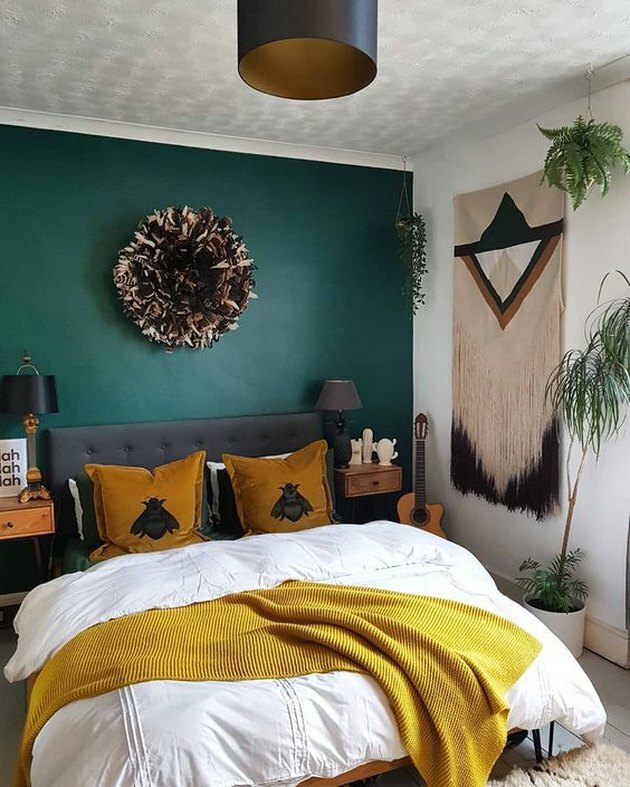 This cozy green bedroom idea from Jenni over at I Spy DIY is giving us full on Montana vibes with earthy hues and brushed brass. Area rugs, patterned accent pillows, and a bed throw add tons of texture. 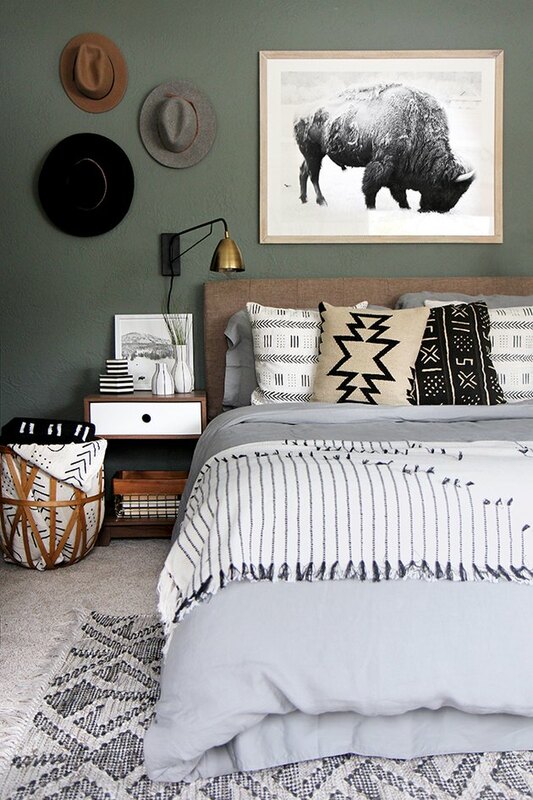 And the framed buffalo print is the perfect finishing touch. We're gaga for this intense, velvety shade. The paint is clearly the star in this bedroom belonging to Will from Bright Bazaar, but the refined elements — such as the wingback upholstered headboard and vintage Oushak rug — are an exceptional supporting cast. 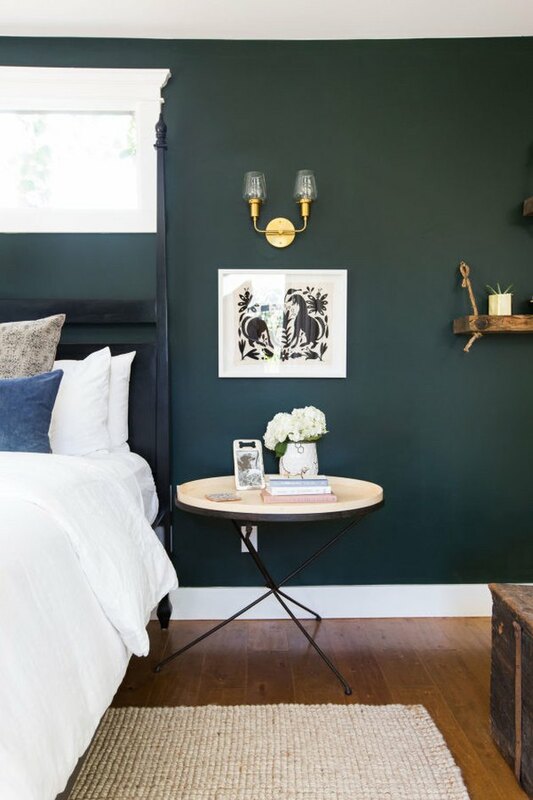 Dark green walls transform this space belonging to Homepolish designer Haley Weidenbaum into a tranquil retreat. Sumptuous linens infuse a relaxing hotel getaway vibe, guaranteeing you'll never want your staycation to end. There's a lot to love about this green bedroom idea designed by Kristin from Hunted Interior ... starting with the avocado built-ins. A polka dot dresser and patterned pillows punch up the personality. The deliciously vibrant hue in this maximalist bedroom designed by Pati from Style Squeeze provides a striking contrast to the black, white, and natural details. And the DIY headboard is a slam dunk. 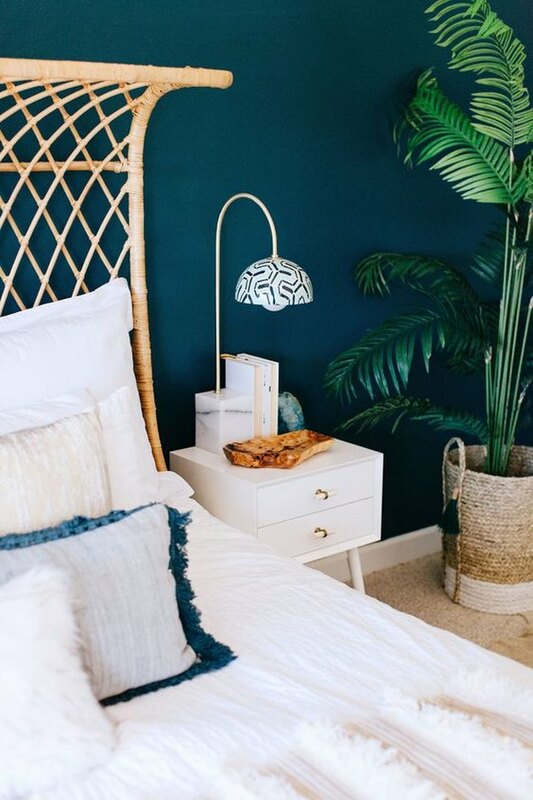 A rich green accent wall sets the stage in this sophisticated, bohemian-style bedroom belonging to Helen over at The New Saintly. Greenery, an oversize fringe wall hanging, and a mustard yellow bed throw extend the sense of cozy tranquility. Peacock perfection! The jewel-tone wall color in Alexandra Evjen's boudoir is a bold choice that works beautifully with the bohemian vibe. A few of our favorite features — and there are so many — include the rattan bed, hanging chair, and furry ottomans. We're swooning over this dramatic shade in Shehzeen from The Desi Wonder Woman's bedroom makeover. 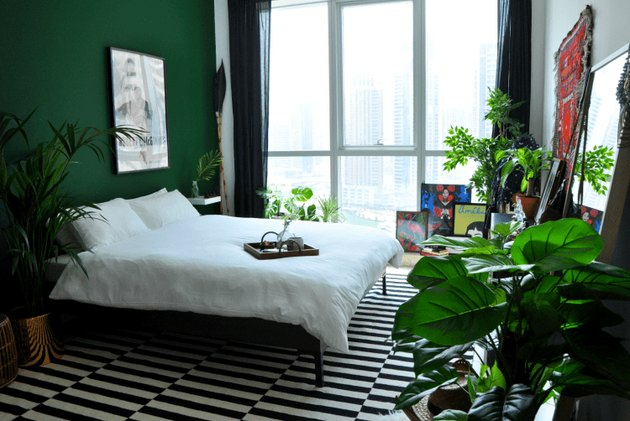 Coupled with vibrant green plants, a black and white area rug, and a vintage movie poster framed above the bed, this space is simply magical.